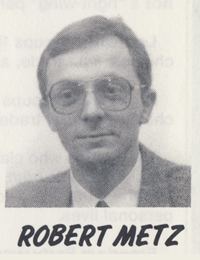 On September 3, 1987, during the Ontario general provincial election of that year, Freedom Party president Robert Metz was interviewed by Bill Paul. Topics include: Sunday shopping; strikes; Freedom Party; Garbage strike; property rights; Marc Emery; Ayn Rand; BIAs; censorship; FP media coverage; London Chamber of Commerce debate; free trade. Radio Station: 106.9 CIXX FM – London, Ontario (Fanshawe College), also known as “6X”. Date: September 3, 1987 (not certain if this is the broadcast date or the recording date or both).